I was pulling the trash cans to the curb when my neighbor across the street called out to me, “Look up.” I did, immediately ditched the trash can, and ran for my camera. I was lucky and the bronze and brown hawk wasn’t disrupted by my motion beneath him. He sat prettily for his portrait against the overcast sky. He’s a beauty, and I believe he is the same hawk I’ve written of in past posts. For some reason he brought to mind pole-sitters. I’m assuming that in the generations born after me, most people have no idea what constitutes a pole-sitter. Pole-sitting didn’t take a lot of skill, just a bit of bravado and endurance. This post is part of Pull Up A Seat Challenge. Photo Challenge – What is That? Thanks! I appreciate the comment. He had a lot of dignity, if a bird can have such a trait. Glad you could take this picture of a sitting Hawk, very nice. He was sitting in front of the house as if waiting for me to get my camera. I think it’s a red-tailed hawk. We had one in our old oak tree a few weeks ago. Great shot! Thanks Anne…I need to get better at identifying them. 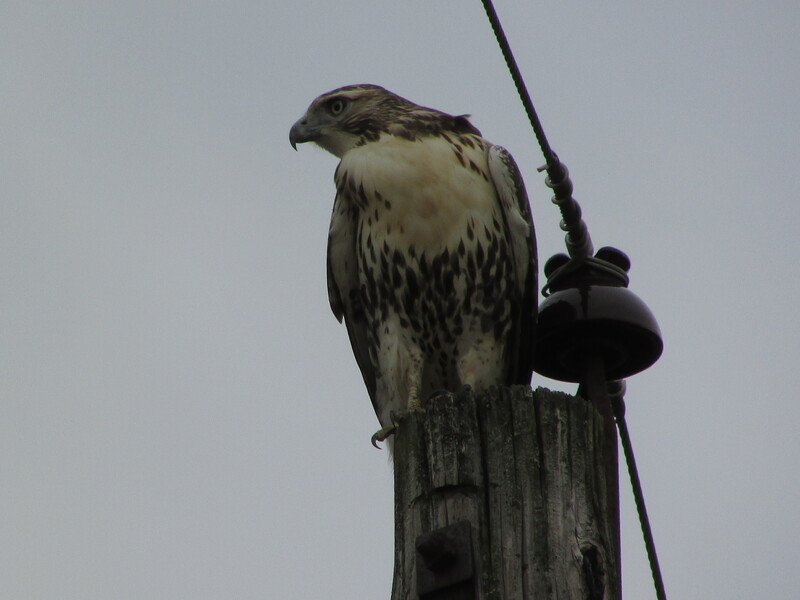 We also have a smaller hawk of some kind that I will see in our yard or the neighborhood. I’m new to hawks, not having noticed any in NY. I’m sure hawks were there, but my eyes were not perceptive. It’s funny how our sight and sights change as we reach full bloom. I think I reached full bloom twenty years ago!! I’m fading now. Guess it’s a miracle I saw a hawk in our tree. Here in the NC mountains we have a pole sitting fundraiser every winter. Sometimes the temps are brutal but the “volunteer” doesn’t give up. Very regal looking. So glad he patiently waited while you grabbed your camera! Enjoy your weekend. Thanks and you do the same. Pole sitting is new to me! I remember reading about it in a book on the fads that we had in our home library when I was in my teens. That’s a long time ago now. I wonder if anyone does it now. Thanks so much. The bird is truly a beauty. Wonderful photo of the Hawk! Such a magnificent creature! Thank you. It’s a great weekend! Beautiful hawk. The term pole sitting was vaguely familiar but I didn’t know what it meant. Thanks for the fun post. It was a fad almost one hundred years ago. Thanks for the comment.